But wait! There’s more! There’s also the world’s saddest coupon! Why are you still so sad!? You’re about to save ten cents! Unfortunately, the trickiest deodorant problem a girl has isn’t under her pretty little arms. That was solved long ago. The real problem, as you very well know, is how to keep the most girl part of you—the vaginal area—fresh and free of any worry-making odors. Now, finally, there is a way. It’s called Pristeen. 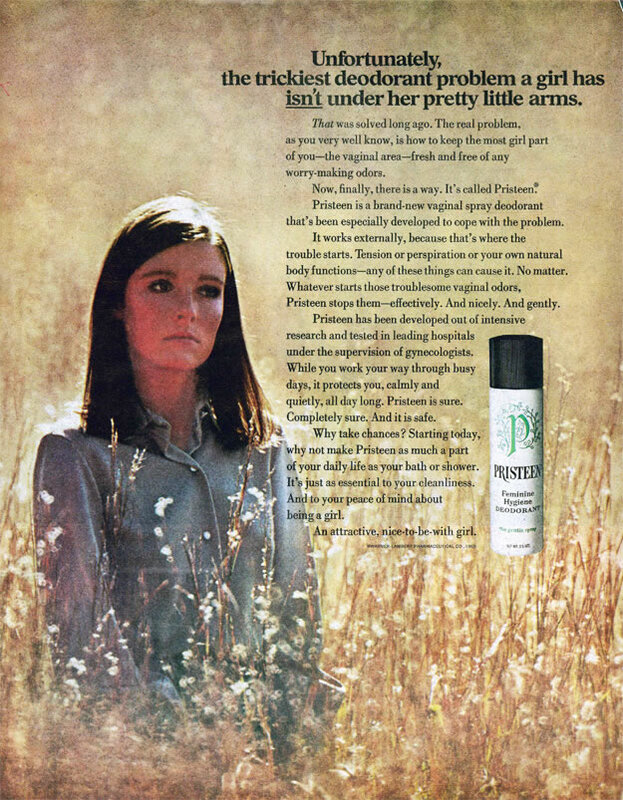 Pristeen is a brand-new vaginal spray deodorant that’s been especially developed to cope with the problem. It works externally, because that’s where the trouble starts. Tension or perspiration or your own natural body functions—any of these things can cause it. No matter. Whatever starts those troublesome vaginal odors, Pristeen stops them—effectively. And nicely. And gently. Pristeen has been developed out of intensive research and tested in leading hospitals under the supervision of gynecologists. While you work your way through busy days, it protects you, calmly and quietly, all day long. Pristeen is sure. Completely sure. And it is safe. Why take chances? Starting today, why not make Pristeen as much a part of your daily life as your bath or shower. It’s just as essential to your cleanliness. And to your peace of mind about being a girl. Use it and you’ll save 10¢ on your very first purchase of Pristeen. Now, isn’t that a nice little extra incentive?